No matter where I go, there’s always a small, dark or dreary bathroom lurking in the background that’s dampening someone’s mood. In fact, there’s one in my own house – an uninspiring powder room just a few feet from where I’m sitting now. In an attempt to help me figure out what do with it, I wrote down some ideas that’s demonstrated many times over to make any bathroom feel more spacious. It was published in the Seattle Times recently. Bathrooms are tricky spaces. There’s a lot going on in them, and often very little room for it all. Yet, there are few things as pleasing as walking into a bright and spacious bathroom. Assuming that you cannot move the walls to gain more space, there are still some tricks you can use to make your bathroom feel bigger. The number one trick to create space in a room is to make its walls feel as if they stretch on for ever. Non-uniform walls—where the paint color is in contrast with the tile color on the walls, for example —draws our attention to the differences and brings the wall forward. To get the walls to recede, choose a wall paint color that matches the color of the tiles. The same goes for tiles. If your goal is to make your room feel more spacious, don’t get too creative with accent tiles. Contrasting strips and blotches carve up the walls and only emphasize the boundaries. The point is really to get the backdrop of the room to fade away into the distance. It’s better to draw attention to an eye-catching vanity unit than a colorful strip of tiles on the wall. A little trick that creates the feeling of more space in a bathroom—as in any other room—is to lift the furniture off the floor. A floating vanity opens up the floor space beneath it. So does any other storage unit, like a linen cupboard, that stands on legs. The floor is seen to extend to the walls instead of ending where the furniture starts. I could not find the source of this lovely bathroom with floating vanity against the charcoal blue wall. If you know who it belongs to, please let me know. Lifting the vanity off the floor extends the floor area. A shower curtain steals your space. It acts like an extra wall in your bathroom. By replacing it with frameless glass, you’ve just visually pushed back the walls at least two feet. To expand the room even more, take the glass as high as you can afford to go. You will also have the added bonus that clear glass acts a little like a mirror and bounces light back into the room. Chances are that you hardly even use your bathtub. 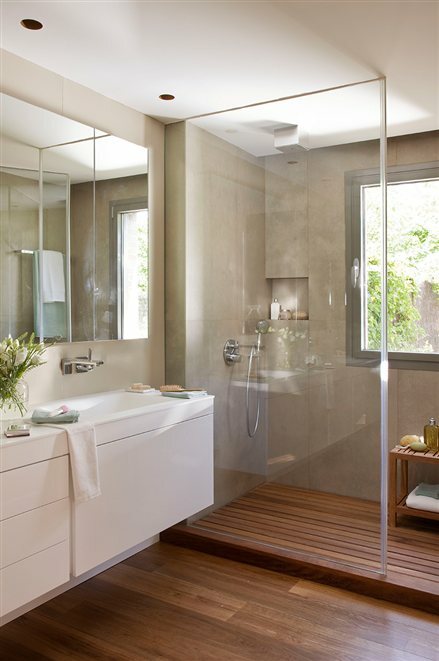 Replacing it with a walk-in shower will dramatically increase the floor space of your bathroom. The ultimate joy is a shower without a curb – go for it if you have the option. Whatever tiles you use for the shower floor, keep it uniform with the rest of the floor. A dark room feels small. A well-lit room feels airy and spacious. Bring as much natural light into the room as you can, and add dimmers to both the general and task lighting for flexibility and different uses at different times. A large mirror can easily make your room feel twice as big. Mirrors add endless depth, and also reflect light from adjacent rooms into the space to brighten it up. Stretch your vanity mirror all the way to the corners to create a horizontal band, or take it up to the ceiling and add light sconces on the sides. A cluttered room can never feel spacious. To make your bathroom feel larger, keep your stuff out of sight. Maximize the storage space under the sink with pull-out shelves and organizers. Keep everyday items around the basin and bathtub—if you don’t level it in favor of a walk-in shower—in beautiful baskets and trays for easy access. Many of these tricks will also work for any other room that feels small and cramped. Two of the most effective, and easiest tools that you can use with maximum effect are mirrors and lighting. I’d love to hear if there’s something that you have done that made your room feel more spacious. If you are stuck with a room that’s cramped or soul destroying, sign up for an e-consultation or room focus – and let us help. Posted in Bathrooms, Uncategorized and tagged accent tile, bathroom remodel, bathtub, color, glass doors, mirrors, paint, remodel, shower curtain, shower doors, small room, Space Planning, walk-in shower, window.